Keratoconus (or conical cornea) is a disease that results in thinning of the central zone of the cornea, the front surface of the eye. As this progresses, normal eye pressure causes the round shape of the cornea to distort and an irregular cone-like bulge develops, resulting in significant visual impairment. The poor quality vision occurs primarily from irregular astigmatism and distortion that results in the image focussing at multiple points instead of a single point focus, giving an image that is ghosted, flared or appears doubled and distorted. It does not cause blindness as such, but can lead to disabling vision loss. The cause of keratoconus remains unknown, although recent research seems to indicate that it may result from a combination of genetic and environmental factors. Some cases of keratoconus have a hereditary component and studies indicate that about 20% of keratoconus patients have affected relatives. If there is no evidence of keratoconus in successive generations of a family, there is less than a 1 in 10 chance of the children of a person with keratoconus also having the condition. Other genetic diseases are associated with keratoconus, including Trisomy 21 (Down's Syndrome), Marfan's Syndrome, Ehlers-Danlos Syndrome. Some studies point to keratoconic corneas lacking structural fibris that maintain the stability of the cornea, leading to a thinning and weakening of the cornea. Oxidative stress may also be linked to the development of keratoconus. Under this theory, keratoconic corneas are unable to eliminate free radicals and self repair resulting structural damage like a normal cornea. This weakens the bonds in the cornea. Keratoconus is often associated with atopic diseases (hayfever, eczema, allergies, asthma etc) which can result in people having itchy eyes. Excessive and vigorous eye rubbing can break down the fibres of the cornea and has therefore been implicated as a causative factor or a trigger to progressive keratoconus in persons having a genetic disposition to the disease. Keratoconus can be difficult to diagnose in the early stages as the initial symptoms can be associated with other eye conditions. A telltale sign as the disease advances is frequent changes in spectacle prescriptions and increasing complaints from the patient about their corrected vision. Keratoconus is usually diagnosed with a corneal topography, an ophthalmoscope, a retinoscope or a slit-lamp examination. 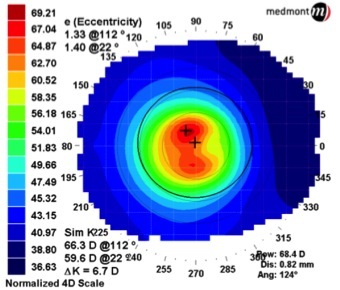 The corneal topographer is the best instrument for detecting early keratoconus as it creates a computer-generated colored topographical map of the cornea that highlights the development of a cone. Measurements of corneal thickness are also useful for diagnosis. Corneal ultrasound or pachymetry can accurately measure the corneal thickness and can detect thinning that occurs in keratoconus. Normal corneal thickness is approximately 0.55mm (or about the thickness of a credit card). Corneal Tomography is another method of measuring corneal shape and corneal thickness. This technique measures the front corneal surface and the inside corneal surface and so provides a comprehensive measure of corneal thickness across the whole surface. Corneal topography, corneal tomography and corneal ultrasound are simple, quick and painless. Most patients with early keratoconus will not have any obvious corneal signs, substantial corneal thinning or significant spectacle corrections. Accurate and reliable corneal topography or corneal tomography are the best methods for detecting any changes of the corneal shape. This will allow an appropriate assessment of each patient to determine which patients had significant progression and so need to be referred for consideration of corneal cross-linking (CXL). The initial symptoms of keratoconus are usually a blurring and distortion of vision that may be corrected with spectacles or soft contact lenses in the early stages of the condition. Frequent changes to the spectacle correction may be required as the cornea becomes progressively thinner. The onset of keratoconus can be anywhere between the ages of 8 and 45. In the majority of cases, it becomes apparent between the ages of 16 and 30 years. Keratoconus tends to be more aggressive when diagnosed in adolescence. Progression usually continues until the age of about 40 years. Because it affects people from puberty onward, it can have a significant impact on a person's education, work, social and family life if not treated correctly. Keratoconus generally affects both eyes. Even though keratoconus is basically a bilateral condition, the degree of progression for the two eyes is often unequal; indeed, it is not unusual for the keratoconus to be significantly more advanced in one eye. 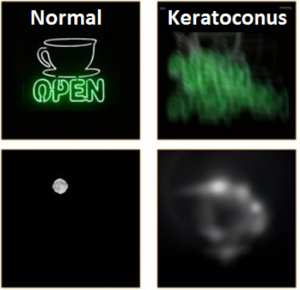 Studies show that keratoconus occurs in one eye only in a very small percentage of cases (<1%) - and in those cases keratoconus may be present in the other eye but undetectable.